I admit it. Patience is not something that comes easily to me. No, I should be more honest. I am quite impatient. But I value very much the quality of patience and would like to become more patient. Ever since moving into this house two and a half years ago, I have found a very nice and delicate way to develop and practice this virtue of patience. It is a personal practice or lesson for me, delivered in the the way I like it - small, beautiful, and self-taught. And as an added bonus, it makes my fingertips smell so fragrant afterwards. 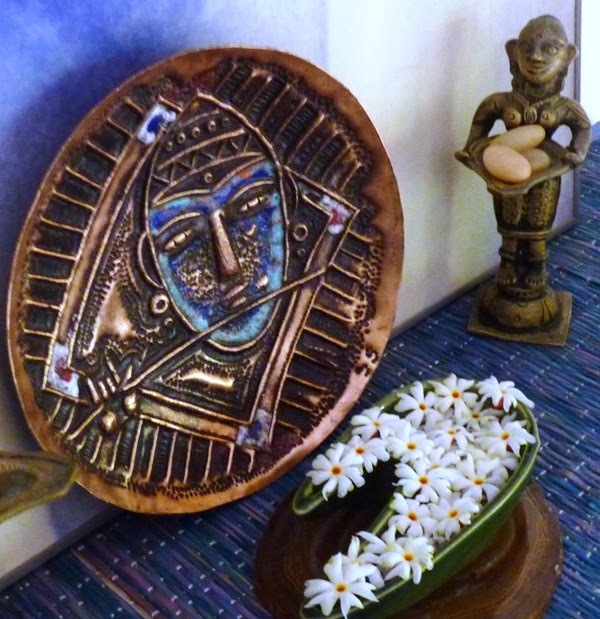 All I do is go out in my garden and gather the little and tender flowers that are showered upon the ground by the good and gracious Parijat/Harsingar/Night Jasmine tree. Every morning this few-years-old sacred tree (so thankful to the previous owners of the house who planted it), the Divine Tree which is also known as Tree of Sorrow or Wish-granting Tree*, offers to the Earth below its most precious gift in the form of beautiful and delicate flowers. And I, a child of this Mother Earth, wanting to grow in my aspiration to become more patient, gather some of these flowers and bring them in my home. Now starts my little lesson in patience - to slowly arrange these tiny and fragrant flowers so that each flower stands white-creamy side up and on its tiny orange foot. Of course, the first impulse is to gather these flowers in my palm and just immerse myself for a few seconds in their divine fragrance. Having done that, the blossoms which are somewhat soiled by the wet earth need to be tenderly cleaned making sure that neither their small white-creamy petals nor their tiny orange centers are broken. As they are drying out for a bit, I decide upon the appropriate vase or container or bowl in which I want to do the arrangement. Then starts the most favourite task of picking up and arranging these tiny flowers, one by one, white side up, orange side down. My most preferred way is to float these flowers in water. Sometimes for the sake of contrast, I might also alternate and put in a few blossoms upside down, but that is very rare. There is something so beautiful about the way the tiny orange center shines through the middle of the white-creamy petals. The flowers stay nice for two to three days, and interestingly even as they begin to wither away they just take on a darker creamy shade and don't really look so bad. At least to my eyes they don't! And when you are ready to give the old flowers and the used water back to the Mother Earth (by way of either putting them in a compost bin or doing what I prefer, which includes simply sprinkling the flowers and the water under some plant or bush in the ground or in a pot), you come across this beautiful yellow-orangish coloured water which has taken in itself the vibrant, fiery colour from the flowers. The orange or saffron center of this sacred flower represents the fire in the heart, the source of all our energy, the fire that purifies, the fire of aspiration, will, and perseverance. It is believed that the dye produced from the central part of Parijat flowers was used to colour the robes of monks and ascetics in olden times. And in our times too, we find that the Mother of Sri Aurobindo Ashram gave to this sacred Parijat flower a most appropriate spiritual significance - Aspiration (Innumerable, obstinate, repeating itself tirelessly). At times when I don't have much patience and don't feel like doing my lessons either (though on these occasions I pretend to myself that I don't have much time, but really, it is the patience that I lack or the aspiration or will to practice my lesson in patience!) but I still feel like arranging these flowers, the result might look something like this. Or some variant of it. And when I have just a little patience or want my practice session to be really really small, I gather only a small bunch of flowers so that I can do only a small arrangement. Something like this. I can't tell you how happy I was to find this tiny shallow vase at the Matri store on my last visit to the Delhi Branch of Sri Aurobindo Ashram. It is just perfect for small parijat arrangements to be offered to a small round Krishna in copper. I am quite certain such a lesson may not work for most people, and I myself haven't really made a conscious effort to examine whether a constant practice of such lesson has helped me in any small measure or will help me if I continue with this over the next many years. But what I do know, or rather what I do feel, is that the very act of gathering these tiny flowers one by one from the ground and spending the next half hour or so cleaning and arranging them makes me forget whatever pressing demands there may be on my time. And in those few minutes there is no hurry, no rush-rush to finish up the task at hand and move on to other things. There is simply a quiet joy of doing something delicately beautiful. Being with the sacred flowers. Being with the task. Just being. * There are many legends and cultural significances associated with this special tree and these special flowers. For a quick read, see here. Photo credits: 1 - Suhas Mehra, all others - Yours truly.